Phil Neville says seeing the anger on some of his player’s faces after naming his side to face Canada on Friday was “fantastic” as competition for places in the England squad heats up. Neville named a 25-player squad with several players who missed last month’s SheBelieves Cup success returning in addition to the same players who traveled to the United States. With Neville aiming to give minutes to players who need them over the coming games against Canada and then Spain on Tuesday night, he admits there was some disappointment and anger when he named his starting 11 on Thursday morning. “The look of anger on some of their faces, the disappointment was fantastic,” said Neville. “Twelve months ago, I’d name a team and there were maybe five or six players who were just happy to be here. Neville is keen to protect the players who have played a lot of matches recently, with Chelsea having had midweek games in the Champions League and Manchester City still fighting on all fronts domestically having gone all the way in the Continental Cup. It could mean some of the Manchester City players looking forward to playing at their home stadium on Friday night may be some of those left disappointed, but Neville says he’s drawing on experience from last year coming into these games. “I don’t like April games,” he admitted. “Last year we played Wales and Bosnia and I didn’t like them then. I’ve got players who have got Champions League games, fighting for league titles, players who are going back to the USA for the start of their league. He added, “We need to protect the players who are playing three times a week. If we get into pre-camp in May playing catch-up we won’t win the World Cup. The support from every manager has been phenomenal, they’re all on our side and it’s a two-way street so I’ll protect players who need it on camps. Izzy Christiansen is still out but joined the team for camp on Monday along with Jordan Nobbs and Fran Kirby. Neville said there’s no long-term issue with the Chelsea forward while Christiansen has returned to Lyon to continue her “brutal” program as she aims to be fit for the World Cup. 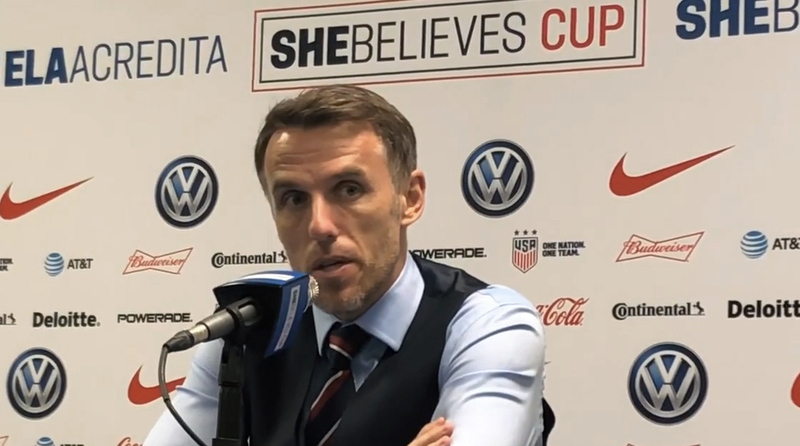 Attention, though, for Neville is firmly on Canada, with Tuesday’s game against Spain currently an after-thought as he looks to build on a successful SheBelieves Cup. England at times looked susceptible at the back but were much more clinical going forward than in the last few friendlies at the end of 2018 and Neville gave open insight into why he feels his side haven’t always been finding the back of the net. “The goal-scoring thing is that I’ve neglected the center forward during my time as manager,” he admitted. “I want to play this style and that’s probably why the forward hasn’t scored the most goals for us and it’s something we need to get better at. On Canada themselves, it’s the first meeting between the two sides since the memorable World Cup quarterfinal in 2015 and the first time Neville has come up against them. Now under the guidance of Kenneth Heiner-Møller, it’s a side rich with talent and one that sits just below England in the FIFA rankings. “In Canada, we wanted that physical impact but we also wanted to play one of the best teams in the world. Spain is there maybe more because of Japan. They are a tiki-taka type team. They are different types of test and we have players who I can give them the type of test I think is missing from their game, which is important. England have just moved back up to third in the FIFA rankings, two places ahead of Friday’s opponents, though Neville freely admitted his views on the importance of the rankings have somewhat flipped since he took the job.